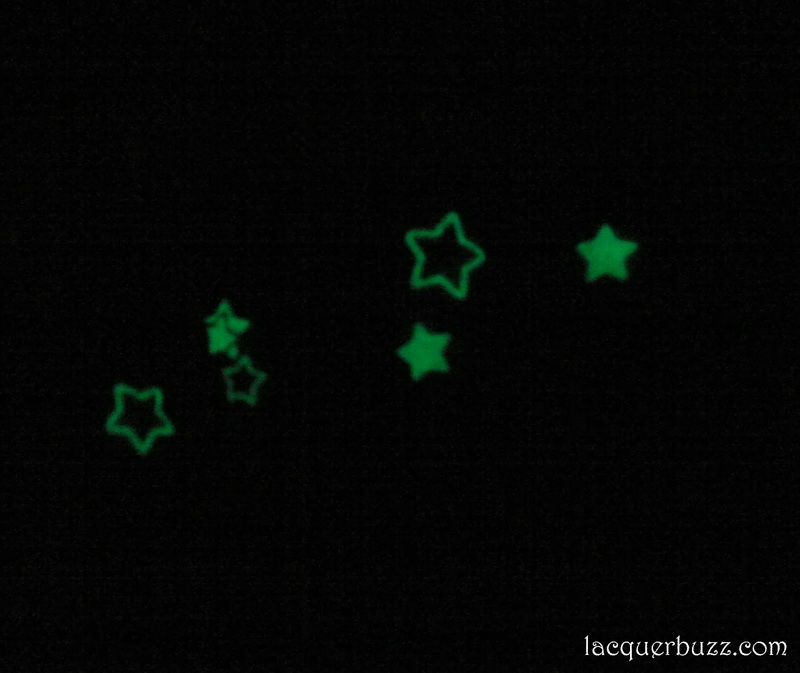 The glow in the dark water decals* come in a sheet that roughly contains 35 designs. You can find them here along with several other patterns. The stars are number 005. 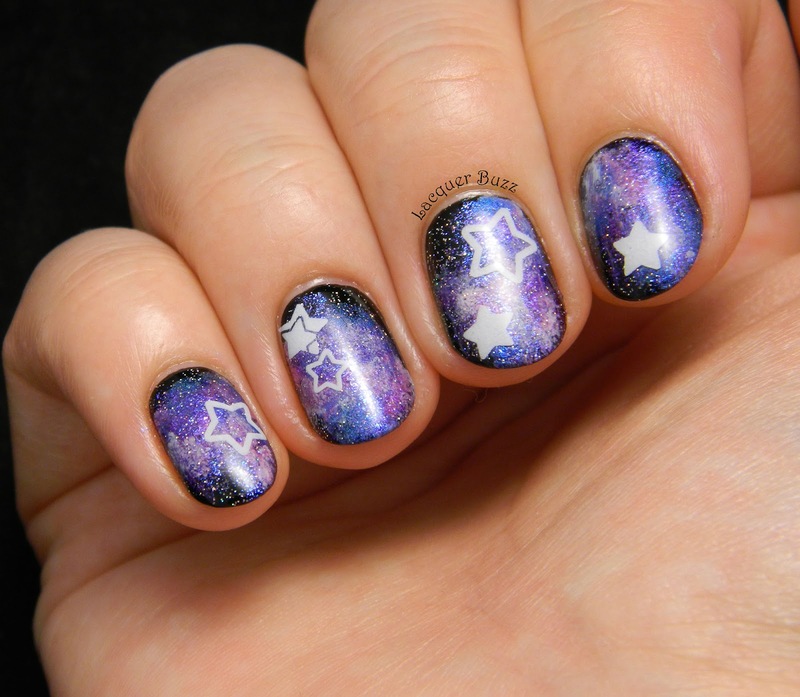 Application is very easy: you just start with dry nails, cut the designs you wanna use from the sheet and dip them into a glass of water. After about 10 seconds the water decals slides off the little paper backing and you can place it on the nail using tweezers or your fingers. 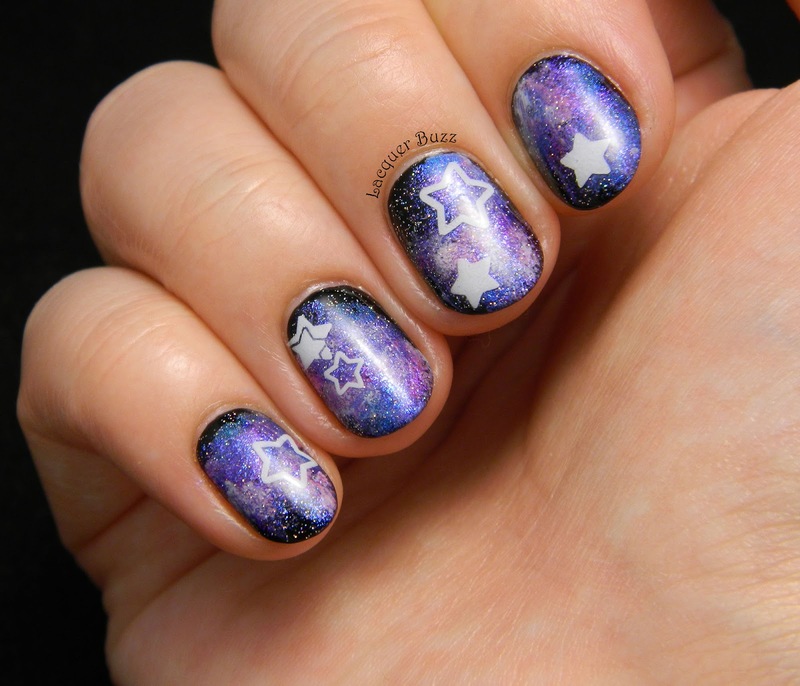 For a step by step guide on how to apply water decals please refer to my tutorial. 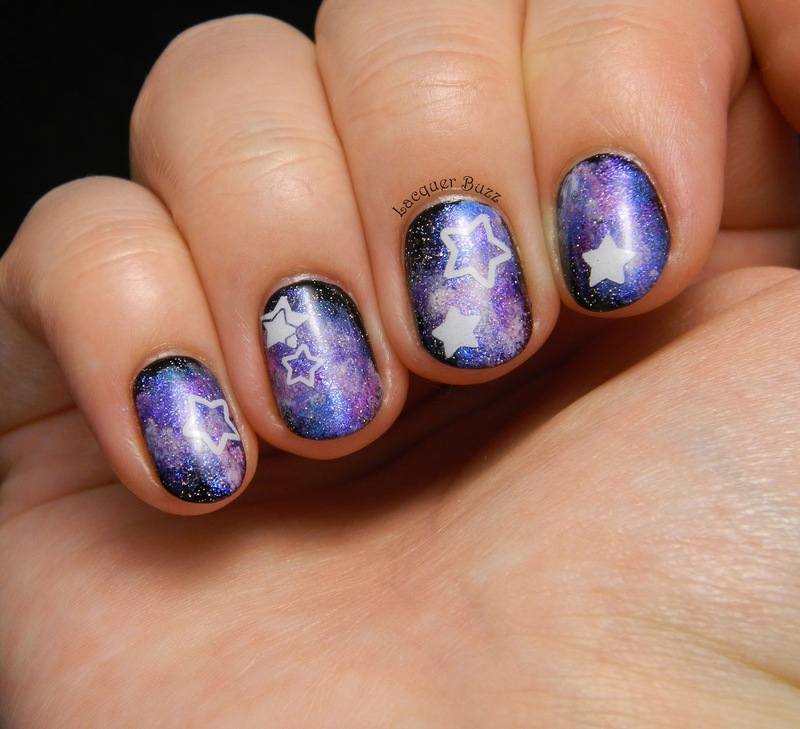 The galaxy base for this manicure was created using several polishes. The technique is very easy because there's no right or wrong way to do this. There are several tutorials across the internet but I don't think you really need one. Just use a sponge and start randomly applying different colors over a black base. I used white, pink, blue, turquoise and even mixed them together. Whenever you feel something doesn't look that good just sponge some more color on top. I finished everything with a coat of INM Northern Lights (holographic microglitter) and after it dried I applied the stars. I finished everything with a coat of top coat. As you can see in the photo above, the glow in the dark effect is quite strong on these. You do need to "charge" them a bit by placing them under a light. Then it's time to play in the dark! If you plan on getting these or any other stuff from the Born Pretty Store don't forget to use code MFL91 at checkout. Pai tu ai contribuit la idee ca daca nu faceai galaxy cand le-am primit nu imi venea nici mie. Multumesc tare mult! Eu de-aia nici nu mi-am mai luat Fairy Dust. Il am pe asta de ani de zile si desi n-am facut niciodata galaxy clasic deja daca il dau peste negru arata singur ca cerul instelat. L-am folosit de zeci de ori.